A vote against the anti-smoking measure may not have been any more of a defeat than a vote in favor, considering how watered-down the House version is. Really? Those exceptions probably don't amount to 10% of the public places in this state. Rep. Charlie Brown (D-Gary), who has sponsored the bill year after year, was, quite rightly, furious at the all or nothing approach of smoking ban lobbyists. As he pointed out, the legislature is about compromise. Compromising now and getting 90% of what you want in no way jeopardizes coming back later to get the remaining 10%. In fact, having a law in place makes it easier to do that not harder. As Rep. Brown notes apparently the American Cancer Society and other smoking ban advocates fail to understand how the legislative process works. People's views change over time and legislators' votes reflect that. 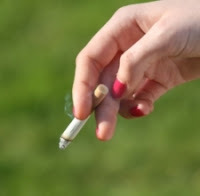 The arrogant, condescending, all-or nothing legislative approach of smoking ban advocates may have permanently turned off the legislators to considering a state-wide ban. That will probably make advocates of the ban happen because they seem more interested in complaining than actually accomplishing anything at the legislature. Thwarting a legislature from interfering with property rights is accomplishing something. Government officials have no right to regulate the acts of consenting adults. As James Madison so aptly put it"
"Government is instituted to protect property of every sort; as well that which lies in the various rights of individuals, as that which the term particularly expresses. This being the end of government, that alone is a just government, which impartially secures to every man, whatever is his own"